This easy soup comes together in about 30 minutes! It is a huge crowd pleaser, especially for kids. Who doesn’t love the ham and cheese combo? 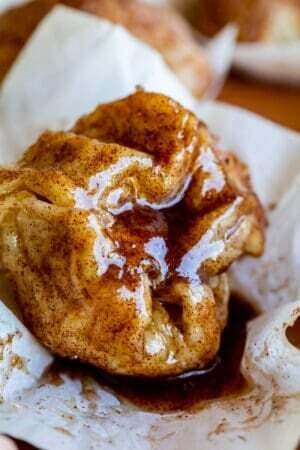 It would be perfect to serve on Halloween or any busy weeknight! We made it! We are in our new house! And nobody’s in the hospital as a result of moving my piano! It’s a miracle. So far we’ve only had one flood, which is better than two floods. Look, here I am, being positive! We bought the washer and dryer from our rental house, because we knew they worked and they were cheap. But in our rental, the washer and dryer lived outside in a detached garage. And apparently I never noticed that it leaks occasionally. WHO DOESN’T NOTICE THAT? Well I noticed yesterday when it flooded our laundry room and soaked the edge of our just-shampooed-earlier-that-day-carpet. (Seriously. The carpet guy came in the morning and it was still damp when dirty water from the washing machine seeps into it.) Welcome to home ownership, where everything breaks and you have to pay for it yourself! Here’s my favorite part. The laundry flooded when Eric was at work, of course. So he comes home and starts poking around, and watches it go through TWO CYCLES with no leaking. You know what this means right? The washing machine will only leak when I am at home alone, and eventually I will start to look like a crazy person who can’t do a load of laundry without setting up a chair and popcorn just to babysit it. Please tell me something broke in your house immediately after you bought it?? This is normal right?? How bout this soup though? I love ham and cheese. I could probably eat a ham and cheese sandwich every day of my life and be happy. But now I have the soup version so I will make this instead. 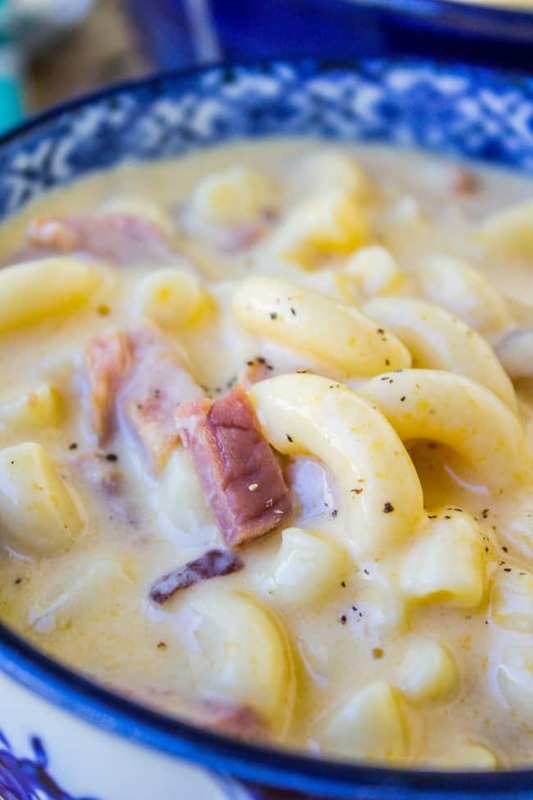 It’s tastes exactly like Mac and Cheese, only in soup form, plus chunks of smokey ham. What’s not to love? Do you guys make a ham at Thanksgiving? How bout Christmas? I know that seems like a long ways off, but there are never enough leftover ham recipes in my opinion. Especially since I never wait for after the holidays to make them; I’m a firm believer in the 5-dollar ham steak. The best part about this recipe? It comes together super fast. We are talking 30 minutes. And thank goodness because who has time for all this cooking when I have washing machines to babysit. In a medium pot, cook the macaroni according to package directions. Drain as soon as they are al dente. Add a little oil and stir so they don't stick if you are not ready to add them to the soup right away. Meanwhile, in a large soup pot melt the butter over medium heat. When it is hot, add the flour and mustard. Use a whisk stir it up. Slowly whisk in the chicken broth and half and half. Turn the heat up to medium-high, and stir constantly until the mixture comes to a low boil, about 5 minutes. Immediately reduce the heat to low and stir in the shredded cheese. Stir in the macaroni and ham. Keep the burner on low until it is as warm as you like. 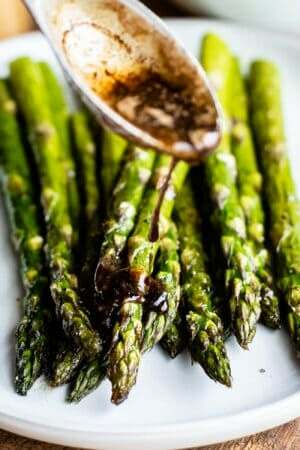 This is great served with a big salad and bread. If you want some veggies in your soup, frozen peas make the perfect addition. Just add them with the macaroni and heat on low until thawed. 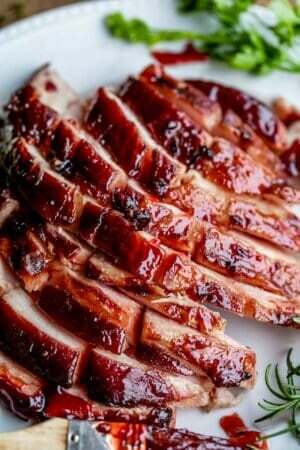 *I used water and 3 and 1/2 teaspoons Better Than Bouillon Chicken Base. Sometimes I like to add frozen veggies in to make this a little healthier. Throw in some frozen peas in when the soup is done. Or if you want to add frozen broccoli or green beans, add it to the pasta during the last 3-4 minutes of boiling. Super easy! 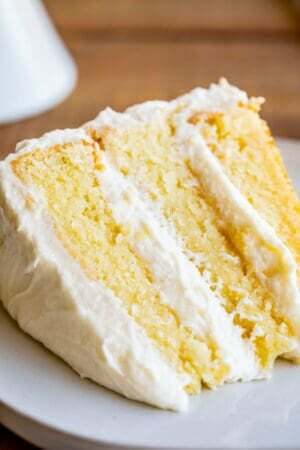 Source: This recipe is a classic from Land O Lakes! I made a few adjustments. 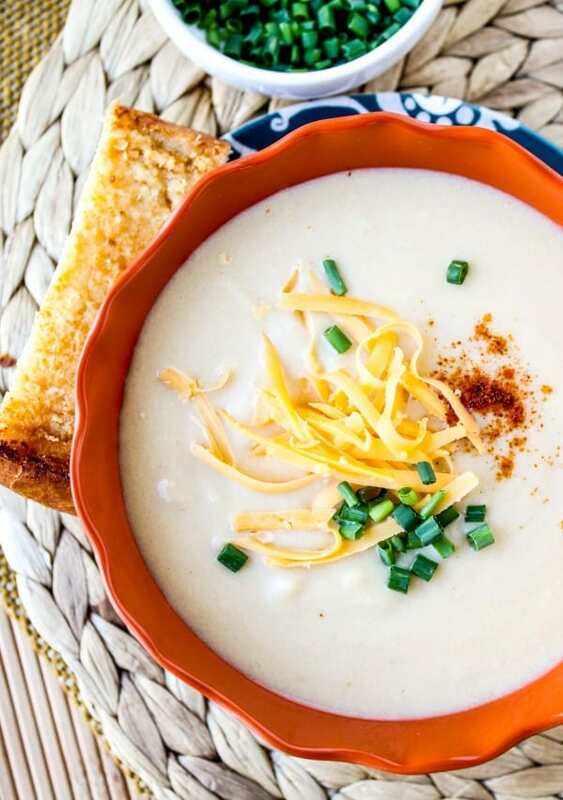 Easy Cheddar Cauliflower Soup << just made this again the other day. It’s probably one of my own personal most-made recipes on my site. Love this stuff. Cheeseburger Soup << I make no apologies for the pickles in this soup. Just try it. You guys want to see one of my first posts?? Scary photo alert! But this (super easy) Ham and Potato Soup is still just as good nearly 4 years later…plus it’s fun to read about what a paranoid new mom I was since these days I am practically negligent. 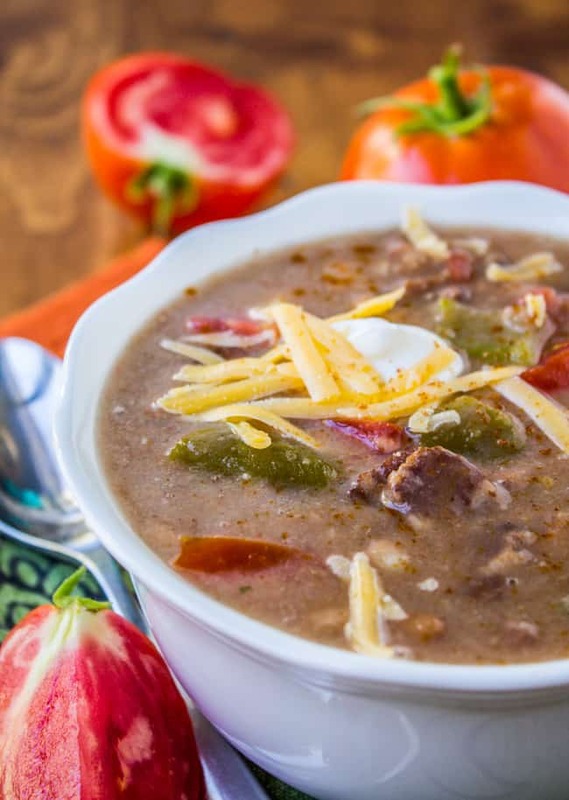 And in case you missed it last week…the famous Cowboy Bean Soup! 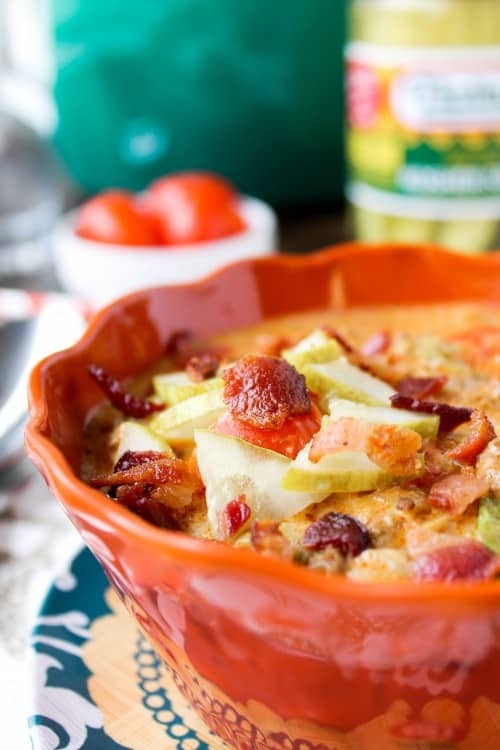 Cauliflower Soup with Ham and Cheese from Taste and Tell << this sounds like my 2 favorite soups combined!! I’m so glad you liked it David! It’s a classic! Thank you for all of your easy, and awesome recipes. This is easy, economical and soooooo good! I’m so glad you liked it Julie! I almost always have the ingredients on hand to make this (ham in freezer) so it really is economical :) Thanks for the review! Could you please include nutrition in your recipes. I made the Mac and Cheese soup tonight for my family. I almost doubled it, I’m glad I didn’t. It makes a good amount. Even after everyone had seconds, I had four small leftover containers leftover for lunches. We all loved it. Thank you so much for sharing. I’m so glad you liked it Sarah Jo! Thanks for commenting and leaving a review! This soup looks delicious! I’m going to make just a few adjustments to be gluten-free for my family. I know it will be so yummy! Thanks Michelle!! You guys are going to love this one!! I had to make a couple of adjustments due to ingredients on hand, such as orecchiette instead of macaroni and whipping cream diluted with 1% milk instead of the half-and-half, but I stayed with the required quantities and the spirit of the recipe. It is very good the and luxurious. Reheats beautifully, especially with grated zucchini or peas, as suggested (I tried them both). Now, if only I had a magic wand to make it a low fat, low cholesterol soup, I’d make weekly. But it really delivers in flavor and texture for such a quick recipe and, as an added benefit, appeals to picky eaters. “Luxurious” is a very good word to describe this recipe Diana! I’m so glad you like it. Thanks for the feedback and review! I love hearing from you! Has anyone tried to make this gluten free? Buying GF noodles is easy but I haven’t tried a flour substitute on a dish like this yet. Our friends’ daughter has celiac but loves Mac and cheese so this seems like a no brainer for when they come over if it’s possible! Hey Megan! You could totally make this gluten free! Just use GF flour and GF noodles! The recipe looks great, and I love Ham and Cheese too, do you still baby sit your washing machine??? HA I know it is just like that with me, call the expert and it does not fail the darn thing calls you a liar and they think you are going senile. HA HA, That I chuckled at. Fortunately the washing machine is going strong to this day Marie!! So happy to report that they have not committed me to the insane asylum yet for phantom washer floods! Haha! Yup we were new homeowners we forgot to check the sump pump during the first rain storm. I guess minor flooding is a rite of passage! Hail to the ham steak! I’m excited to have a new use for them! 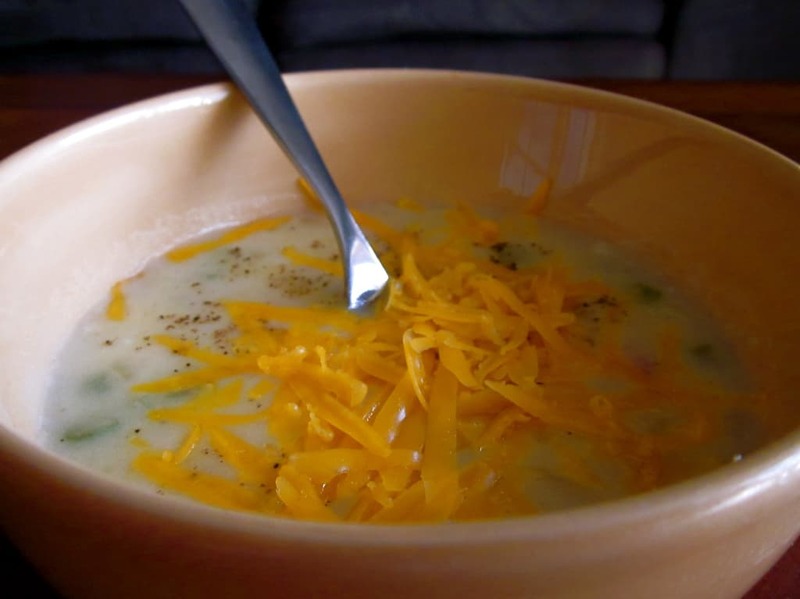 Well you know how I feel about cheese….So I’m sure you know my intense feelings for this soup. Love affair! 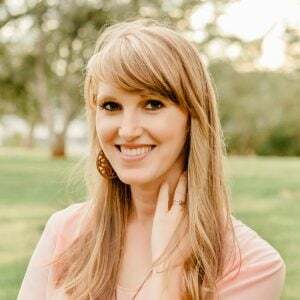 I’m so nervous…and excited about home ownership for that very reason! BUT if it’s any consolation – in our rental, something breaks and the landlords don’t fix it…and we’re not about to pay for it in a rental, so then we just have to live with it broken. 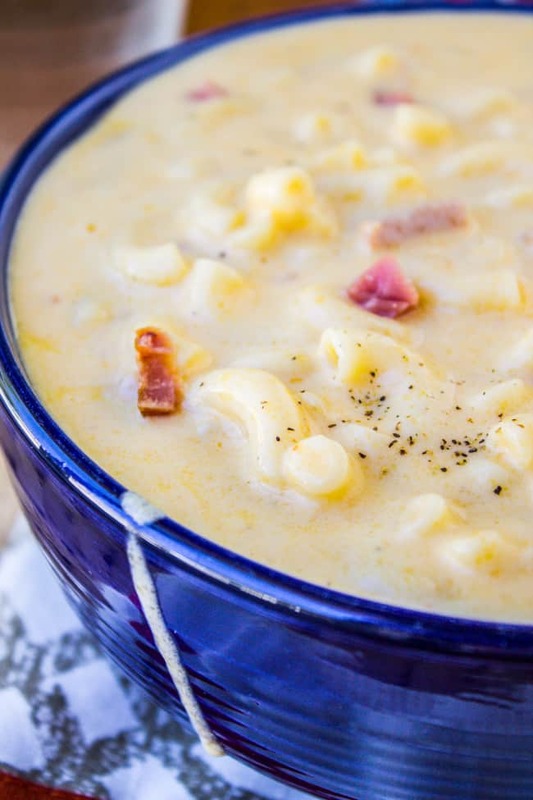 I think I could eat that Mac & cheese & ham soup every day & the rest look good too. It’s inevitable – when we built our house out in the country our yard was nothing but mud. When our brand new washer crapped out after 2 weeks the young newbie repair man they sent came in thru the front door instead of the back & tracked mud thru the entry, across the brand new carpet in the living room, & down the hall. After a couple hours he said he had no idea how to fix it. Funny now, not so much then! Nooo, the muddy boots!! What is it with men?? Do they not understand carpet? At least it’s funny now…I’m sure my washing machine flood will be funny in a few years too…at least I hope so!! :) Thanks Leslie, enjoy the soup! You are not alone! When we moved into our house the fridge and dishwasher quit and there was a family of mice living in the oven! Now this soup is awesome! 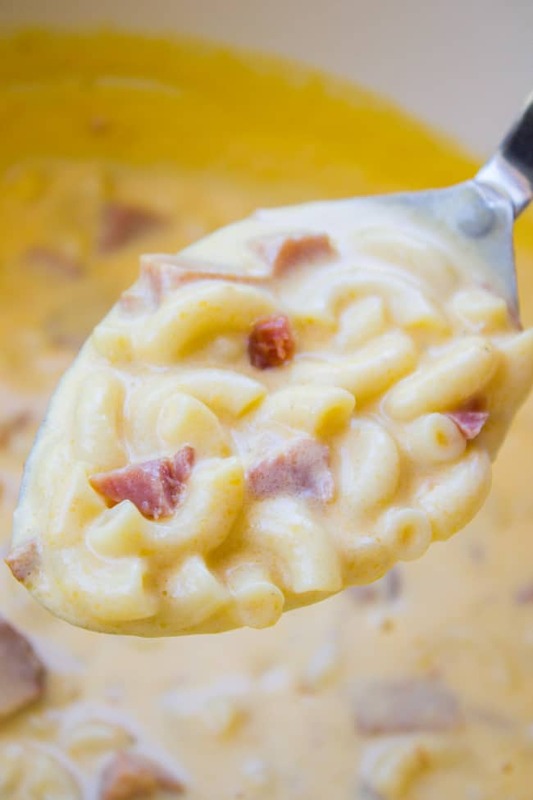 My husband hates soup but loves mac and cheese so thank you for a solution! Your soup looks so delicious and “homey” perfect to enjoy in your beautiful new house! Your house….yep, you’re not alone, this happens all this time! My friend is a realtor and when we bought our home she gifted us with a one year home warranty – saved $$$’s!!! Something breaks (and it will) you call home warranty company and they come out & fix it and you just pay the on call fee! 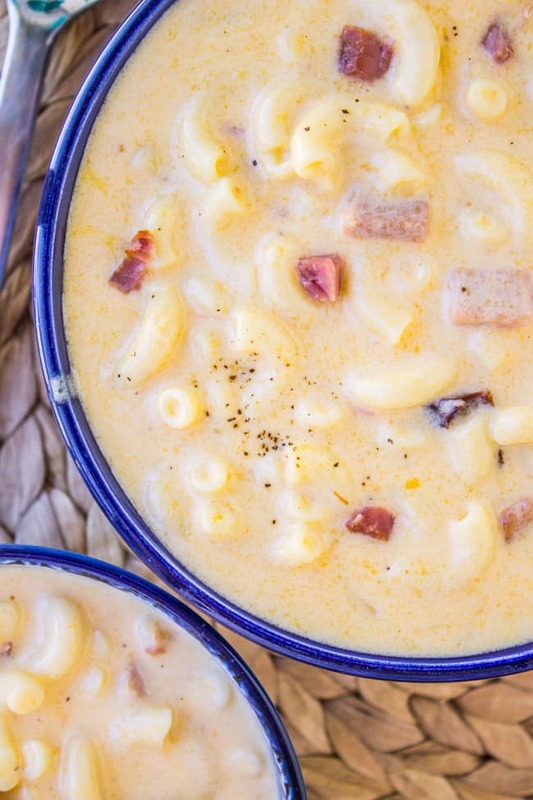 This is such a great mashup – my kids are obsessed with soup and obviously mac & cheese – yum! Pretty sure my mouth is watering right now! Congratulations on your New Home… I’ve been in mine for 42 years and I’m still working a kink out here and there.. Enjoy it everything will work out. Going to try this soup the first chilly day we have, Looks yummy!!! Haha, don’t feel bad. When we moved in to our house (we just bought our first in April) we discovered the microwave didn’t work, the oven only had two working burners and half the control pad didn’t work, and the dishwasher leaks when I do a deep clean sanitizing solution. Then, we’re in the house for like 3 weeks and our dryer which we bought used off craigslist like 4 1/2 years ago caught on fire. So in the 5 1/2 months we’ve lived in our house, we’ve had to buy a new microwave, a new dryer, and a new stove. It happens. But at least I know the new stuff won’t be going out anytime soon. Try switching to powdered detergent. That’s what works for us when we had that issue. Also not over filling it. We moved into our new house on Friday and the storm this morning (southern California) showed me all the places that our roof leaks. Fun times. Of course this happened when my husband was out of town on a business trip, too. Cheers to home ownership! I’m right there with ya! This soup sounds amazing! The next time it rains here I am making this soup and enjoying my soon-to-be non-leaky roof! This soup looks so rich, creamy, and tempting! I could eat this all the time. If something doesn’t break in your new house the first week, it means you’re going to be eaten by zombies. Trust me you’re not alone! Although sitting by my washing machine with a bowl of popcorn actually sounds kind of fun…I think I have too many children.